Most of what we know about the origin of the father of Mary Jane Forster (nee McLean) comes from the immigration records from his arrival in Sydney on the “Sarah Botsford” in 1842. Both Edward McLean and his first wife Mary Jane (nee Gordon) were from the north of Ireland (Ulster) and they were both Presbyterians. Their religion, as well as their surnames indicate a probable earlier Scottish origin. Maybe their ancestors, like the Beattys, had come to Ireland from Scotland as part of the Plantation of Ulster in the 17th century? Edward McLean was the son of Hugh and Isabella McLean, and was a native of Stranorlar, Co. Donegal. His father was still alive when he left home. Mary Jane Gordon was from “Donymanah” (Donemana?) Co. Tyrone, 21 miles from her husband’s birthplace. Her parents were Robert and Margaret Gordon, and both were alive when she left Ireland. Edward was aged 23 and his calling is “Farm labourer”. Mary Jane was 24 and a “Farm servant”. With them were their two children Margaret aged 3 and James aged 1. Edward could read but not write, Mary Jane could neither read nor write. On arrival in Sydney, both were assessed as “Likely to be useful”. Edward must have been considered a responsible young man, because in his care during the voyage were three young women entrusted to him by their families, including Margaret Long who had “travelled with him from home”and remained a close friend of the McLeans in Sydney. Why had the McLeans undertaken the gruelling four month journey to Australia with two very young children? Apparently overpopulation in Ireland particularly affected poorer people even before the worst of the Potato famines in 1845, and there were incentives to go to Australia where labour was in short supply. The McLeans were “bounty immigrants” whose fare was paid for them, and the ship’s captain had an incentive to ensure their safe arrival. 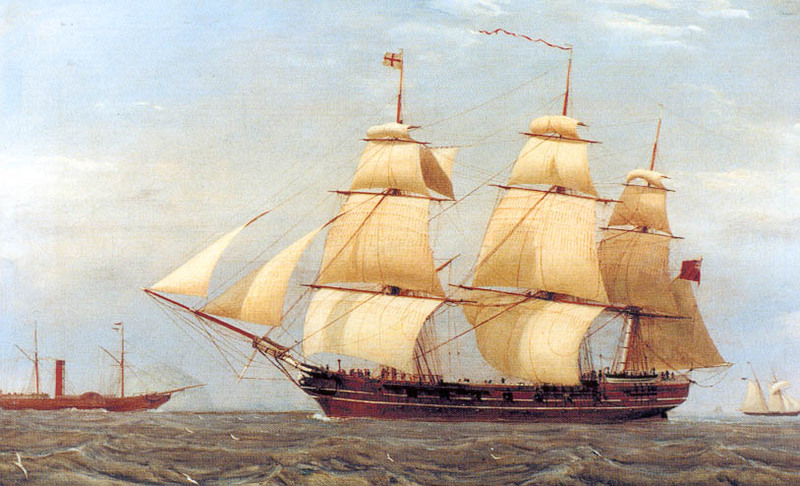 They travelled from Ulster to Glasgow to board the Sarah Botsford, which left from Greenock, a port of Glasgow in October 1841. They arrived in Sydney 16 Feb 1842. In Sydney the family lived in Balmain where Elizabeth was born in 1843 and Robert in 1845. In June 1847 Mary Jane died aged 32 during or soon after the birth of a still-born son and both were buried at the Parish of St. Andrews. Five months later 9 Nov 1847 Edward married Eliza “Bolk” at St. Andrews Church. Both signed their names “X”. Their only child, Mary Jane, was born at George St., Balmain 24 Nov 1849. Edward was then a Milkman, and his wife was Eliza “Boak”. It is interesting that they named their daughter after Edward’s first wife. Was Eliza a friend of the family? The sum of £60 has been granted to Edward M’Lean, in compensation for injuries sustained in the year 1849, when assisting the police at Balmain, and as a reward for readily coming forward when called upon for the purpose. As a result of his injuries Edward died 6 March 1853, at their home in Balmain aged 35 “after four years painful suffering, caused by a kick in the side, while assisting the constables in the execution of their duty”. It must have been hard for his wife Eliza and the five children. Mary Jane was only four, and Margaret, the eldest was about fourteen. Three years later in 1856 aged about 17, Margaret married John Shiels at Windsor. Within three years in 1859, the Shiels began “catering for tourists” at Regentville House near Penrith. Apparently the rest of the family then lived with the Shiels at Regentville House. Eliza and Mary Jane were still living with them in 1869 when Regentville House burned down. Eliza McLean was there at the time and attempted to save some furniture. Interestingly she is named as Margaret’s mother, not step-mother. Evidently the family stayed close. Robert McLean must also have lived with the family in between missionary trips (see the story of how Mary Jane met William Mark Forster in the chapter of the story on The Forsters of Rothbury) At the time of the fire the Shiels’ also ran Woodford House (formerly Buss’s) in the Blue Mountains, as mentioned in the fire inquest report. 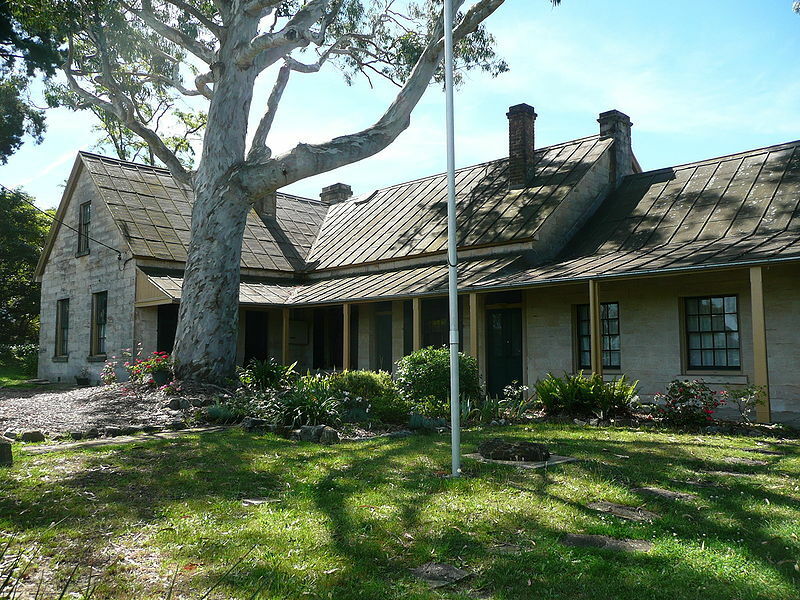 Mary Jane McLean lived at Woodford at the time of her marriage to William Mark Forster, and it was also where their marriage took place 1 Sept 1869, witnessed by Robert and Helen McLean. The newly married couple went to live in his home town, Melbourne. Advertisements continued to be placed for Woodford house in the name “J. Shiels” until October 1869. Margaret Shiels is next heard of in 1873, moving to Bathurst. Margaret’s husband John Shiels doesn’t seem to be mentioned again, in any of the subsequent advertisements or news reports about Mrs Shiels. What happened to him? Did he die or did they separate? I’m told (see comment from Kate below) that by 1891 Margaret Sheils described herself as a widow. The other person never heard of again after the Regentville fire in 1869 is Mary Jane’s mother Eliza McLean nee Boak (or Bolk). Could she have waited until her daughter’s marriage to remarry? We have checked the death records of various Eliza McLeans without success. Edward’s eldest son James McLean first appears on the record in the NSW Police Gazette of Mon 14 June 1858. He was indentured to John Dunn, Saddle and harness maker of the Haymarket in Sydney. James is described as being aged 19, 5ft 3ins tall with black hair and a long nose. It looks as though he overstayed his leave to attend the funeral of Henry McCourt, not to be confused with the convict Henry McCourt. Our Henry was a free settler from Ireland and the husband of the Margaret Long who had come from Ireland under Edward McLean’s protection. Their daughter Hannah McCourt later married Robert McLean. According to his obituary James “was harness-maker for Cobb and Co. in the old coaching days”. Cobb and Co. began running coaches from Penrith via Bathurst to Orange and the goldfields in 1862. He was married in Penrith 9 Feb 1867 to Mary Wilcox (or Willcocks). Both were residents of Penrith at the time. 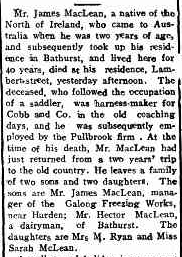 After his marriage James moved to Bathurst, very likely still working for Cobb and Co. By 1873 coaches were replaced by rail transport, but James remained in Bathurst working as a Saddler until his death in January 1916. He had four surviving children. Perhaps Margaret Shiels undertook her “change of air” to Bathurst (see 1873 advertisement above) because she had family there? However she did not stay there many years. As can be inferred from the 1896 article above, she returned to Woodford, and also managed other mountain retreats including “The Pines”, Blackheath, becoming quite a hospitality legend, and died at Leura in April 1911. She is buried at Wentworth Falls. It seems she had no children. Elizabeth, the second daughter of Edward McLean and Mary Jane had married John Craig in March 1864 while both had been residents of Penrith. His occupation at the time was Quarryman. They moved to Orange and had a son and a daughter before John’s death in an accident in 1890. Subsequently, she also set up in the hospitality business in the Blue Mountains, at Leura, assisted by her son Alfred. In 1893 Alfred James Craig was serving as Postmaster at the Woodford Post Office, based at Woodford House which was run by his Aunt, Mrs Shiels. This wasn’t an easy job: “The travelling post office rail van dropped the mail at a place near Woodford House where young Alfred waited beside the railway line swinging a lighted lantern to alert the Guard of his presence…having to go out up to three times a day in all weathers, before dawn, at midnight and at about 10pm to pick up the mail.” (Local Studies Collection Springwood). By 1905 when his portrait photo was taken Alfred was a Real Estate Agent and Councillor on the Katoomba Municipal Council. Elizabeth Craig’s daughter Florence married her cousin William Cuthbert Durham Forster of Melbourne, at Leura house in July 1898. He was 26 and she was 18 years old. They had three children. In 1910 WCD divorced Florence taking custody of the children and married his Secretary. See more about this in Chap 3 of the family story “The Forsters of Rothbury”. Robert McLean the youngest surviving child of Edward and Mary Jane, married Hannah McCourt in Bathurst in March 1874. They had several children, most born at Concord. From 1877 the family lived at Ashfield in Sydney. Much detail of his family can be seen from his obituary. 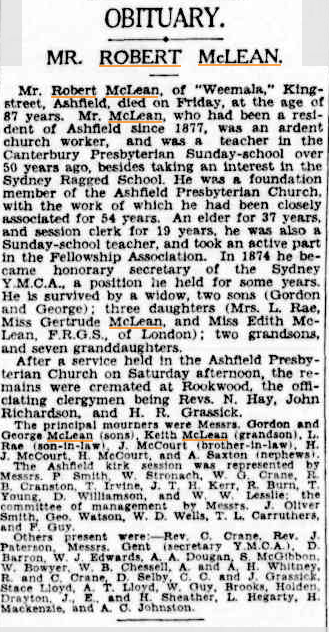 He was the last of his generation of the McLeans, dying 1 April 1932 at Ashfield. One of his nephews on the Forster side, Arnold Saxton, was in attendance at his funeral. Described as “an ardent Church worker” Robert must be the missionary in the story told by Gwen Littleton, whose meeting with William Mark Forster on the ship back from China in about 1867, and subsequent invitation to his home in Sydney led to W.M.s meeting his future wife, Robert’s half-sister Janey McLean. “Home” at the time was probably Regentville House, Penrith. Presbyterian burials in the Parish of St Andrews, 1842, Mary Jane McLean nee Gordon. Marriage certificate 4205 Vol.74B Edward McLean, widower and Eliza Bolk, spinster, 1847. Many thanks for your help in bringing this interesting branch of the family out of the shadows – especially to my research collaborators and second cousins Bruce Forster and Geoff Brown, and also to James McLean descendants. Love this series of articles – it fills in a lot of gaps in my study of the life and work of Margaret Shiels. 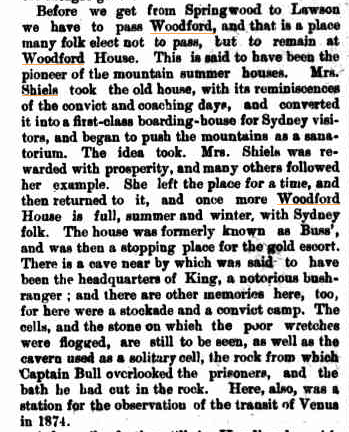 A few observations: The Guest House in the mountains is Woodford not Woodville, When she moved to Bathurst and Mittagong she was known as Mrs Sheils. The spelling reverted when she returned to the Mountains. I am unsure if this was intentional. She refers to herself as a Widow in an1891 court case. The Blue Mountains councillor is A.J.Craig, son of Elizabeth and nephew of Margaret. He also stayed with Margaret Shiels when she resumed the Proprietorship of Woodford House in the 1880’s and was listed as the Postmaster. She probably financed his Guest House ventures into The Palace at Leura. She died a wealthy women with an extensive property portfolio and generous bequests to her nieces and nephews.